I have to admit that I have a few favorite outdoor locations for photo sessions. At the top of the list is Kapiʻolani Park in Waikiki, specifically the Dillingham Fountain on the Diamond Head side of the park. The iconic water fountain is beautiful and the surrounding area has these gorgeous trees. My favorite wind-swept tree arches across a lone bench creating both a romantic and almost magical space. Check out these past photo sessions for shots with this tree (Hong & Warnock, Silva). This was the reason we had set Kapiʻolani Park as the location for our family friends, the Demands. However upon arrival to the photo session, we had noticed that the entire tree had been cut down, leaving behind two stone pillars (which were built to support the "falling" tree). Let's just say that we made the best of it and ended on the Waikiki end of the park feeding ducks. The photos turned out great and everyone was happy, but a part of me inside still mourns for this lost tree. I hope you enjoy these photos, and if you are still looking to get your family photos taken, let's connect. Tis the season for family photos. 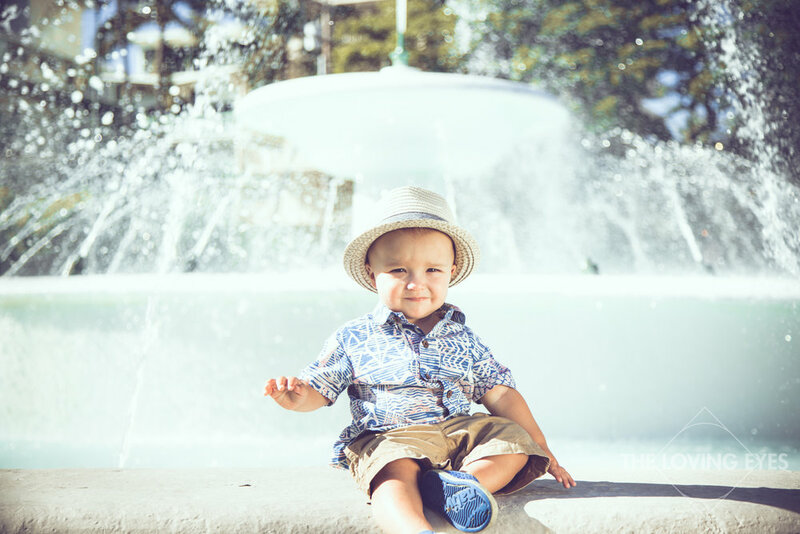 We decided to get some family photos at the beautiful Kapiʻolani Park in Waikīkī. The gorgeous trees and Dillingham Fountain made for a fun and playful location for the little ones. Photographing little ones can be a challenge at times, but when we can have fun, I think it is the most enjoyable part of being a photographer.